The weather around here remains very wet and wintry like. It’s not really cold, just wet. Very wet. This is not a surprise being the Pacific Northwest. If I was not trying to get a fence and a vineyard in, quite frankly I wouldn’t care. However, the weather is wearing on my nerves a bit and thosegrapevines need to get in the ground and take root before warmer weather takes hold. I know, I know, welcome to the world of farming. Anyway, this dish warms the tummy, calms the nerves and serves as the ultimate comfort food. I never seem to get enough of buffalo wings so why not buffalo mac & cheese. Serve as a side dish or a main course. It makes a lot too so you can feed a crowd or use it for lunches all week. I think you will like it, give it a try. Preheat oven to 350 degrees and butter a 9 x 13 baking dish. Bring a large pot of salted water to a boil; add the pasta and cook until al dente, about 7 minutes. Drain. Meanwhile, melt 3 Tablespoons butter in a large skillet over medium heat. Add the onion and celery and cook until soft, about 5 minutes. Stir in the chicken and garlic and cook 2 minutes, then add 1/2 cup hot sauce and simmer until slightly thickened, about 1 more minute. Melt 2 tablespoons butter in a saucepan over medium heat. Stir in the flour and mustard with a wooden spoon until smooth. 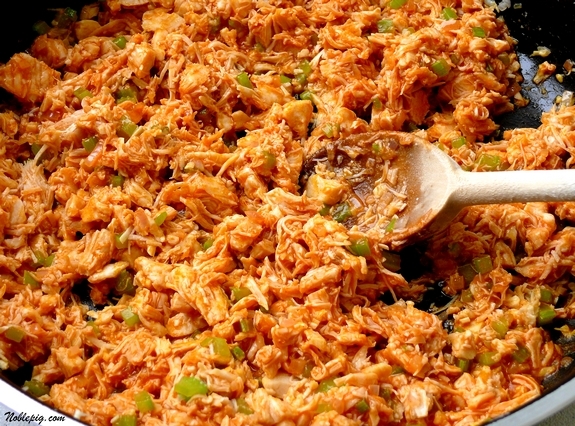 Whisk in the half-and-half, then add the remaining 1/4 cup hot sauce and stir until thick, about 2 minutes. Whisk in the cheddar and pepper jack cheeses, then whisk in the sour cream until smooth. 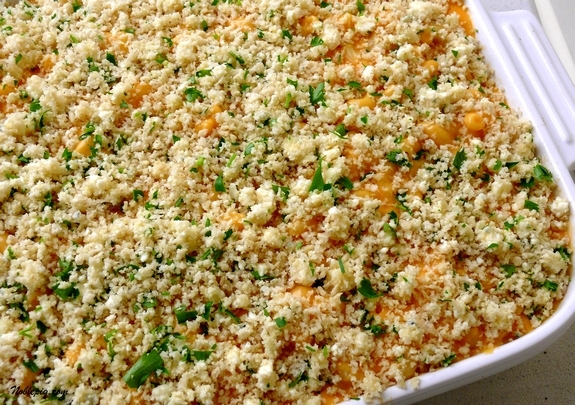 Spread half of the macaroni in the prepared baking dish, then top with the chicken mixture and the remaining macaroni. Pour the cheese sauce evenly on top. Put the remaining 2 Tablespoons butter in a microwave safe bowl and microwave until melted. Stir in the panko, blue cheese and parsley. Sprinkle over the macaroni. Bake until bubbly, 30 to 40 minutes. Let rest 10 minutes before serving. Drizzle with some wing sauce for color. Garnish with even more wing sauce, blue cheese and sour cream if you like, we did! 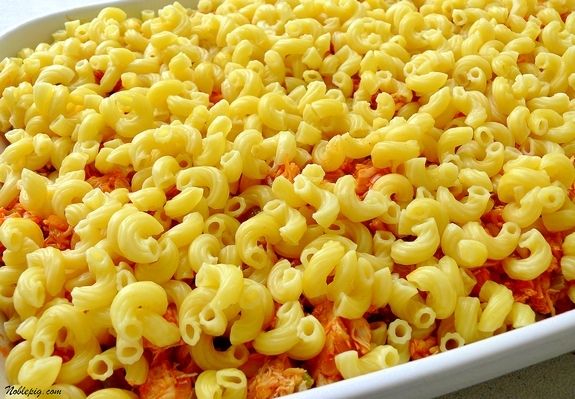 Spread half of the macaroni in the prepared baking dish, then top with the chicken mixture and the remaining macaroni. Pour the cheese sauce evenly on top. Put the remaining 2 Tablespoons butter in a microwave safe bowl and microwave until melted. Stir in the panko, blue cheese and parsley. Sprinkle over the macaroni. Bake until bubbly, 30 to 40 minutes. Let rest 10 minutes before serving. Drizzle with some wing sauce for color. Garnish with even more wing sauce, blue cheese and sour cream if you like! This reminds me of the mac and cheese that little girl that cried all the time made on The Food Network Ultimate Recipe Showdown. Your’s seems much simpler and I might just have to try it!!! YUM! Tho I do not think Jorge (Cruise) would approve. Poo! OMG! This looks dangerously good! My husband might buy me a new car if I made him a tray of this stuff! Holy must have it tomorrow…yum! My teenagers two favorite things are Buffalo chicken and mac and cheese. They are going to love this! This looks fantastic and something I would totally make. But for the blue cheese, not a fan of that. Thanks for an awesome recipe! Bookmarked this one….I often have to feed a crowd and this is just the recipe I need! Good luck with the planting! The weather does cooperate sometimes and you will be surveying your glorious vineyard in the sunshine one of these days. In the meantime good call with the homey casserole:D Mac n cheese is such comforting food. I hope the weather turns around soon. It’s really been a miserable winter all of the country! I’d say the buffalo mac and cheese is a good way to chase away the blues.. Sounds like a good hearty dish. Can’t go wrong with this one! This is comfort food at its best. Whoa! What a great combination of flavors! Wow! My son will love this one! Wishing you some sunshine and fences. This looks wonderful. I think I gained 5 pounds just reading this post. I’m really trying hard not to lick the screen. This is definitely a dish for the doldrums of a rainy day. After reading your status updates in FB, I do feel for you trying to get everything done in the wet weather. If it makes you feel any better, it’s pretty miserable on both coasts right now! Sending my wishes for sunshine, dryness, and a well-planted vineyard! Yumm – what a great combination of flavors! Can’t wait to try it. I wish I could each Mac and Cheese. 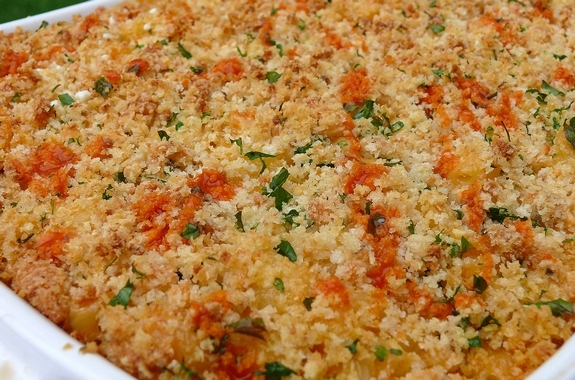 you are the champ of mac & cheese dishes you know. anytime i want to make a kicked up mac & cheese dish i come here. you have the best creations. My kids would love this! With all that spiciness I might too. 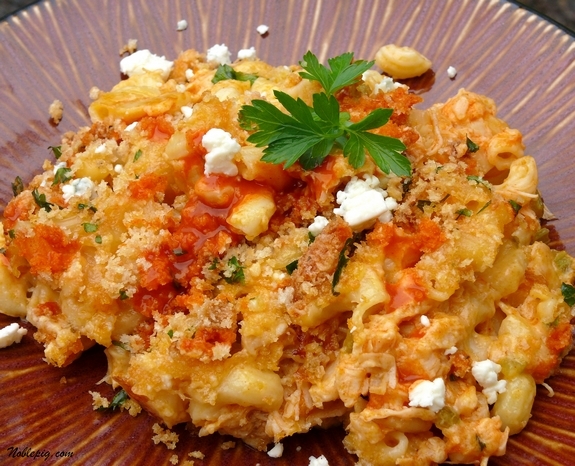 It sounds like a great twist on the usual mac and cheese. This definitely looks worth an extra 90 minutes on the elliptical machine. As for the rain here in the valley, it usually only lasts until the 4th of July. That sure does look and sound good. Comfort food in a pan!!!! OMG-now that’s comfort food! Two foods I love together! My kids just went, ewwww! So I’d better make this for a crowd! barbecue sauce and pepper jack–two staples in my diet. great batch of comfort food, cathy! I love M&C, but only as a side dish. The cheddar sounds wonderful with everything else, and, with the hot sauce, you have to have the sour cream, I’d think! What’s not better with a bit of hot sauce, I ask? 🙂 Buffalo mac & cheese is definitely one of my favorites. All you need is a beer and a bit of time alone. My first thought when I saw this on the Food Network Recipe Showdown was “I bet Noble Pig could make a better version”. Such a weird coincidence I made this recipe yesterday and was just stopping by to see what you might have whipped up over the weekend! Really wierd! Anywho…. this recipe is indeed delish and kind of a modern comfort food. Great choice. You should give wine pairings with your recipes. Oh seriosu yumminess, wow, wow! Well, you’ve somehow managed to pair my two favorite things – mac and cheese and buffalo wings. What a great combination! This looks so good! I have leftover baked chicken…a lot of it actually, and I know exactly where it’s going! This and a great big huge tossed salad…YUM! Oh My goodness this is serious comfort food, I’m going to have to make this. I just did a post on my family’s comfort food Spag Bol Casserole but I think this might beat ours hands down. That looks fab. It’s one of those dishes I can’t leave alone when I make a big batch, I keep going back for another forkful! 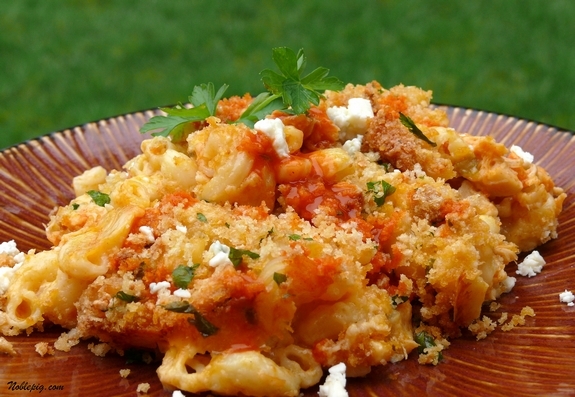 Seriously, is there anything better than mac ‘n cheese…YES there is…when you do it this way! Great recipe. Thanks. Btw, am trying to get to culinary school. Please check out my site and let me know what you think of the ‘desperate times call for creative measures’ road I am taking to get there. I just showed my boyfriend, simply put “oooo, I want” Caveman speak for a must make. Oh my, this looks too good. I think I need to make some this week! Manly comfort food! I made this for dinner tonight. It was really really really good. I did sub half the cream for 1% milk and next time I will use straight milk. It was very rich and quite heavy but super delicious!!!! I just came in my pants after reading this article. Just saw this in the magazine and thought it looked so good. I am going to have to try it soon. This looks amazing, rich and so delicious. Nicely done. How fantastically delicious looking! I can’t wait to try this. I think I might cook up some chicken myself instead of rotisserie, though. Now this is what I love to see … new twists on old favorites. I’m sitting here thinking about how brilliant this recipe is. It’s going into my folder right now! YUM! BACON,CRISPY BACON, I am making this thur. despite my broken ankle..maybe i might like mac & cheese finally! Making this ASAP. My husband says thank you in advance! I’m excited to make this great looking mac and cheese. Looks yummy! Can’t wait to try the buffalo mac-n-cheese! Oooey, gooey cheesy fun! I just made this recipe and it was quite good. I only took about half a bowl of it and that was enough. As one can imagine, it’s very filling. Now I can go take a nap! SO I made this last night. Absolutely FANTASTIC!!! Although, I’m not a big fan of Blue Cheese so I just replaced it with Feta. Still VERY appetizing though. My boyfriend loves hot and spicy and so do I so this was perfect! I’m still trying to figure out what main dish would go well with it though. Yum. I made this the other night for my wife after a long day of work – the perfect comfort food! We cut out most of the butter – who made this originally? Paula Dean? – using just 1 tablespoon of butter for sauteing the veggies. Came out fantastic. This looks so good! I really want to try it argh. Hm i think thats what I’m going to do now! Just got the fixins to make this bad boy. Can’t wait! Just made this for the family tonight. I currently have a head cold, so didn’t taste much other than the wing sauce, but everyone else raved about it! There are definitely leftovers after feeding four people. Another great recipe! We made it and it turned out amazing! I just made this recipe last night for my family. My parents don’t eat spicy food, but they ate this one and said they would eat it again! It was amazing. 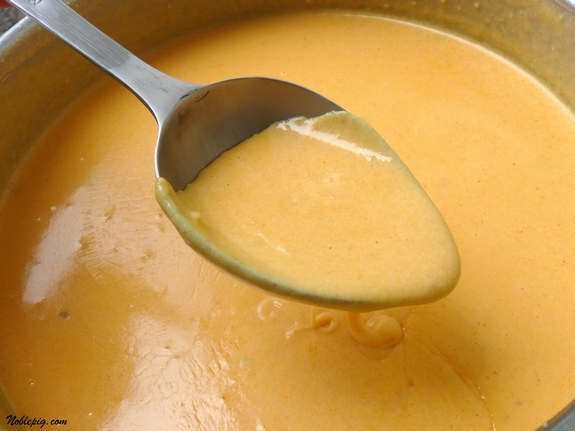 I’ve tried other cheese sauces before and their texture has always been off to me. But this one was spot on perfect! I’ve had it every meal (except breakfast) since last nights dinner! Great job! Is there a link or way I could instantly print just the recipe?? If there is, I can’t find it. I am not very good with this Puter stuff. So I need all the help I can get. Scroll up and next to the time and date this article was posted is a printing icon. Click on it and it takes you to a printer-friendly page. I am an avid food gawker. I absolutely LOVE looking at food blogs… but I rarely comment on them. I don’t know why — I appreciate them so much, I should write more often than I do. I just wanted to let you know how much I admire your blog… and this recipe in particular. Definitely going to be making this one, and DEFINITELY going to enjoy it. I tried this and it was soooo good. Totally a keeper! I tried this recipe once for a family party, I didn’t have it out of the oven 5 minutes before a majority of it was gone. Now I get requests to make it for every function. I made this on Tuesday night. Its Thursday morning and its very nearly gone! Everyone loved it! It is absolutely DELICIOUS!!! Not a difficult recipe at all and a big big hit! Great recipe! I made it this past wkend and your directions were easy to follow, uncomplicated ingredients. It tasted awesome. This is going in my notebook to make again! This recipe is fantastic. I made this for my wife and we just loved it. Super easy to make, outstanding direction. The only thing I would consider doing different is making it with a hotter sauce. Thank you for a fantastic recipie. does anyone have a suggestion for side dishes with this- definitely green salad but what else ? Omg! Yummy…my husband was hesitant when I told him what I was making, thought it sounded too rich. He LOVED it!!!!!!!!!!!!! I had been wanting to make mac & cheese for awhile but when I saw this recipe I knew it was exactly what I was looking for-even better the next day! This recipe was most fantastic. Made it for lunch earlier today, and wow, fantastic flavors. Assembled a double batch last night and cooked it at a tailgate today (UW Huskies v. Colorado Buffalo-seemed appropriate). Used extra chicken and substituted for some of the cheeses (Mexican 4 cheese blend, aged Coastal cheddar, Monterey jack, and bleu). Also mixed the noodles with the cheese sauce, then layered it up, rather than layering first and then pouring the cheese over the top. It was AWESOME! A massive amount of food, served with smoked, pulled pork on the side, devoured almost instantly. Thanks for the recipe -will definitely keep this one. I made this last night and we loved it.My elderly mother who is 89 lives with me.I care for her.She thought the picture looked good.When I served it at supper with a salad and rolls she loved it a lot she said.She told me the next morning that she hoped I made a lot of that casserole we had because it was so good she wanted more.I was afraid it would be too hot for her but the other ingredients help cool that hot down some so it was not too bad.Very delish.I will make this a lot.I did substitute milk and butter for the half and half .And I used 1% milk and it did not hurt the recipe at all.Everybody should try this.It would be great for company or a dish to take to a pot luck or dinner somewhere.I plan on freezing part of this one.Hope that it freezes well . We will see and I will let you know.Thanks for the recipe.I just found your site and we are going to try several of the recipes this month.I look forward to following you for new and other recipes. Hope this isn’t a dumb question ( I still consider my self a novice cook), but do you think u can substitute feta cheese for the blue cheese? You could but the classic pairing with buffalo sauce is a pungent cheese like blue. The feta will get lost in the other bold flavors.